Generally, Tabung Haji depositors are appreciative of the 2017 hibah announced by Tabung Haji yesterday. But as usual, it is the smallest who makes the biggest noise. 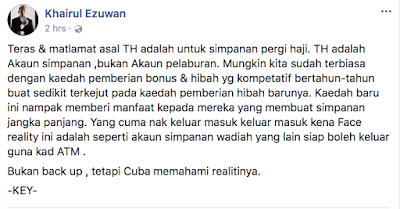 If they can hush for just a minute to really analyse the numbers and put things in perspective, instead of listening to just their own voices, these people may actually see that Tabung Haji depositors - the non-Haji depositors as well as those saving up to go to the Haj - have all done quite well for themselves. Short of conducting a survey, I asked my contacts in the financial sector and also those who are queuing up to perform their Haj through Tabung Haji. what they thought about the latest hibah. 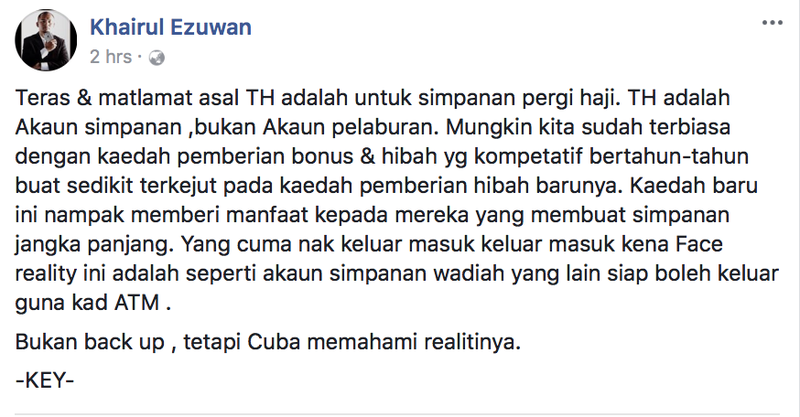 All were quite impressed with Tabung Haji's performance, given that 2017 wasn't exactly the best of years for anybody. "I think it is a reasonable return of 4.5 per cent for non-Haji depositors compared to 3.5 per cent bank deposits. Remember, (these) people can withdraw their money as and when they require. "For those saving to go to the Haj, they get 6.25 per cent, which is good given the low returns on cash, money market and fixed income instruments. For example, the yield for 10-year MGS is below 4 per cent." On the social media, some depositors expressed disappointment with the returns they are getting from their savings in TH. They felt TH should have done better for their money. Fair enough. But one or two people are accusing TH of cheating its depositors. To date, 7 per cent (600,000) of TH depositors have been to the Haj and still maintain their accounts with TH. Out of the remaining 93 per cent of 8.7 million depositors, some 2.7 million have registered to go to the Haj.